Sheila and I have discovered a lovely walk which we recommend. From Ilfracombe, you drive south down the A399 in the direction of Brayford but at Four Cross Way you turn left towards Challacombe. This takes you high up over Kipscombe hill and then you drop down to Challacombe. Before you get into the village you park near the Old School House which you will see on your left. 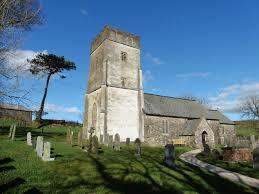 You will see a sign which says ‘Challacombe church, half a mile’. The path, which is marked on the OS map, takes you over a footbridge across the River Bray in a charming setting. Then a wide path takes you up hill on the edge of a beech wood with strikingly tall trees. At the top of the hill you get a view of the church to which the path leads you across a field where you will see mounds which are apparently the remains of the ancient village of Challacombe. Rev Richard Martin became rector of Challacombe in 1861 when the Bishop of Exeter, Henry Phillpotts, was 83 years old and only conducted confirmation services in good centres of population. Bishop Henry died in 1869 at the grand age of 91 and was succeeded by Frederick Temple who came to Exeter at the age of 48 having been headmaster of Rugby school. It caused a sensation in the area when Temple arrived in Challacombe to conduct a confirmation. Richard Martin took him to the top of Kipscombe and pointed out Challacombe church below, explaining that that was where the confirmation service was to be held. In telling the story of what followed, Martin recalled that ‘the moor stretches for miles, and there is hardly a house to be seen’. He remembered how Bishop Temple turned to him and, with a twinkle in his eye, said ‘Well, Martin, what is this the centre of?’ However, the next day, between 30 and 40 candidates were in Challacombe Church to be confirmed. Richard Martin recalled later: ‘I have never forgotten that service or the way in which he spoke to the young people of the love of God, while the tears coursed down his cheeks.’ Richard Martin went on to become the Rural Dean of Shirwell, and Frederick Temple went on to become Archbishop of Canterbury, officiating at Queen Victoria’s funeral. You may think it is a rather Victorian sentimentality to speak of ‘tears coursing down the cheeks’ of a preacher. But actually, Bishop Temple was known for his bluntness and was far from sentimental. His son William, born in Exeter, who went on to become the much-loved Archbishop of Canterbury during the second world war, recalled that his father, ‘though known as “granite on fire” could not preach about the cross of Christ without tears in his eyes’. Since Kelly died 15 years before Temple arrived in Devon, the bishop may well have known the hymn. All five verses are well worth reflecting on as we prepare to celebrate Easter. I am grateful to Father John Roles for telling me the following: In 1887, after his time in Shirwell Deanery, where he was Vicar of Swimbridge, Richard Martin became Vicar of Holy Trinity, Ilfracombe. It was he who rebuilt the Vicarage (which is similar to the vicarage he built in Swimbridge) and his name is recorded in the dormer windows in the nave at Holy Trinity “Restored 1899 – R. Martin, Vicar”.